This natural sal butter sugar scrub recipe creates a natural, nourishing scrub suited for those sensitive to or allergic to shea butter. It also contains healing neem oil and coconut oil and is naturally colored and scented. I scented my sal butter sugar scrub recipe with lemongrass essential oil for its fresh, energizing fragrance and used a pinch of turmeric to give my scrub a lovely yellow tint. Apparently, as I’ve discovered, people with latex allergies and sensitivities are often also allergic to shea butter. Sal butter makes a wonderful substitution. Like shea butter, sal butter is a superb moisturizer and is believed to help with various skin disorders such as acne, eczema and psoriasis. It can also help to reduce skin inflammation. And unlike shea, it stays smooth and creamy, never grainy. Neem oil is a carrier oil that I’ve found to have significant healing properties and many applications for use in both skin care and hair care products. Used both medicinally and cosmetically for hundreds of years, neem oil is naturally anti-bacterial, anti-viral and anti-fungal and possesses moisturizing and regenerative properties. In addition it also has anti-inflammatory and analgesic (pain killing) properties and contains both vitamin E and essential fatty acids. First used in India in 2000-4000BC, neem oil is a key herb used in Ayurvedic and Unani medicine. Neem oil is commonly used topically to treat rheumatism, eczema, ringworm, athlete’s foot, cold sores, psoriasis, warts, chronic syphilitic sores, infected burn wounds, and slow-healing skin ulcers. It has also been show to help control various skin infections including scabies and candida. Using a digital scale begin by weighing out the cocoa butter and sal butter. Heat in either a double boiler or in a large glass Pyrex measuring cup at reduced power in a microwave until melted. Next, weigh out the coconut oil and stir into the melted butters until it melts. Weigh out and stir in the neem oil and essential oil. Weigh the sugar, then slowly pour the sugar into the melted oil and butters, mixing with a fork as you go, until all the sugar is completely incorporated. Add a pinch of turmeric, if desired, for color. Mix well until the color evens out. 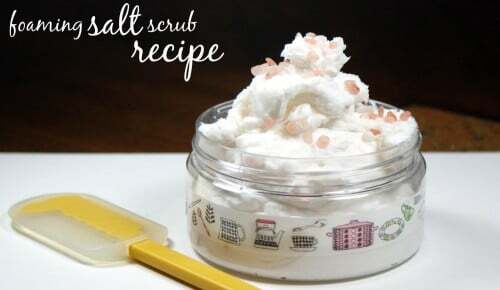 For even more skin care recipes that contain sal butter be sure to check out my foaming salt scrub recipe, my pink salt and sal butter soap recipe, and my simple two-ingredient body butter recipe. For recipes that contain neem oil, view my neem oil recipe archive here. 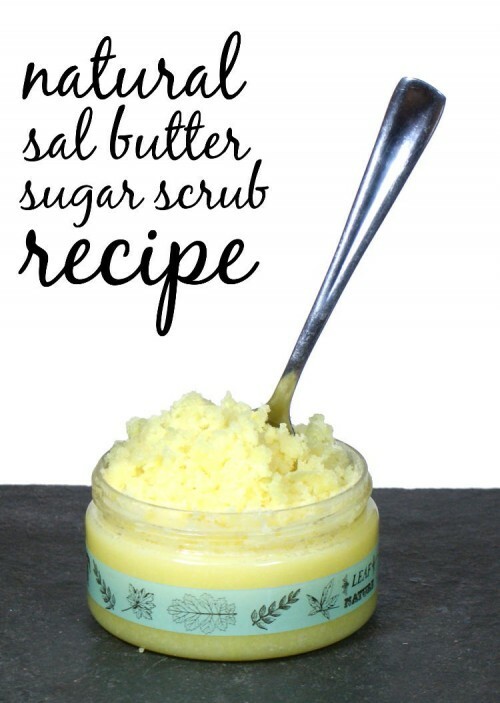 For more sugar scrub recipes, go here. Discover even more homemade skin care recipes on my DIY Bath and Body board on Pinterest. You can also find and follow me on Blog Lovin’, Tumblr, Facebook, Twitter, G+ and Instagram.